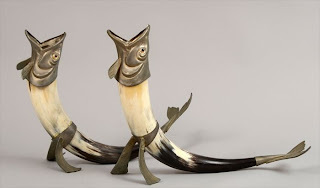 I have often blogged about Stair Galleries in Hudson, NY because they have a reliable source of decorative offerings, and you can find good values much of the time. 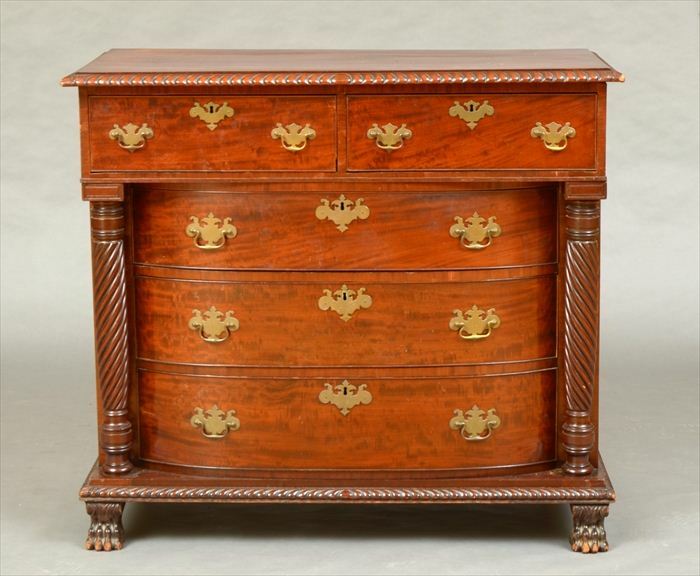 Their Exposition auctions offer the best value and without minimums. We have had success several time buying things at rock bottom prices (and been outbid as well!). We went to the preview and took these pictures. There was a nice selection of furniture classics that can be added easily to any decor style. The auction was last Friday, and here are some results of things that caught my eye. 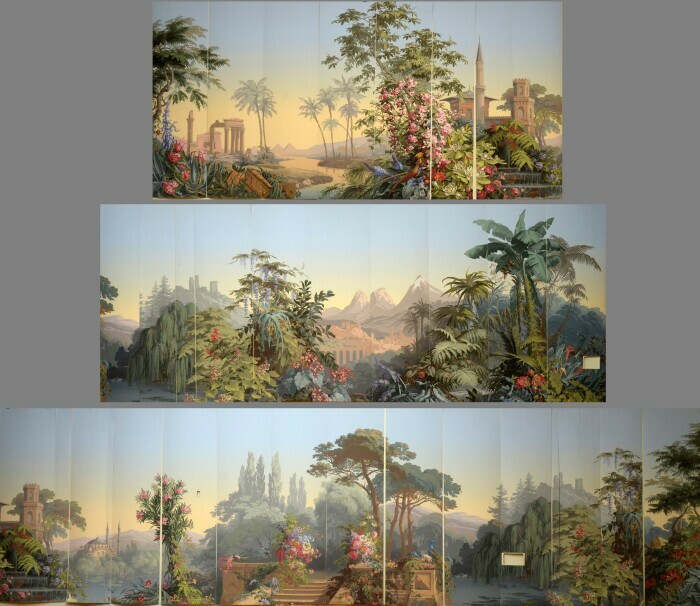 There was a fabulous set of Zuber et Cie scenic wallpaper panels (35 panels in all, running 48 feet). The scene is 'El Dorado'. They sold for $9,500 off an auction estimate of $800 - $1,200! This could be a good value for what they are because I suspect you'd have to pay much more than that for new ones. This American classic style mahogany settee is a lovely shape, and actually pretty comfortable (I sat in it). 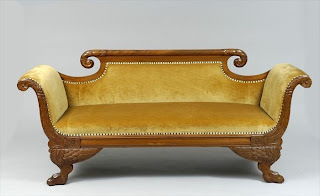 This is the kind of settee that features in the designs of Darryl Carter, among others. He would probably reupholster it in white canvas. The curves make it very sculptural. This sold for $500 off an auction estimate of $600 - $800. 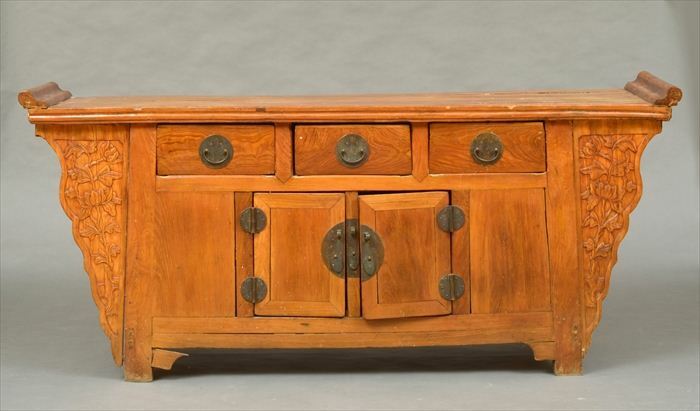 This Chinese hardwood cabinet is very smart looking. 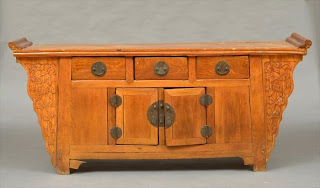 The wood is a warm color, and the carving and drawer details give it loads of interest. This sold for $100 off an auction estimate of $300 - $600. Bargain! These wonderful vases sit atop the Chinese cabinet in my photo above. I think these are just plain fun. They are metal mounted steer horn, and are Italian. They sold for $425 off an auction estimate of $300 - $500. 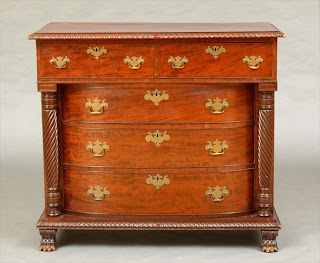 I thought this American classic style mahogany chest of drawers was very good looking. The carved columns and feet give it personality. It sold for $375 off an auction estimate of $400 - $800. Finally, this American classic giltwood overmantel has clean lines and would look great in an entry, behind a sofa, or over a mantel! This sold for $325 off the auction estimate of $300 - $500. It's interesting to see the results of this auction. I took the pictures first, and then checked the results afterwards. There were a number of bargains to be had among the pieces I picked (except for the Zuber panels!). It tells me that you shouldn't get scared off by auction estimates, and bid what you think is the right number for you. You get it or you don't, and then there's always another auction! My services might interest you. I offer installation and restoration of Zuber scenic and specialize in installing reproduction wallpaper in house museums. Most impressive project: The blue room and Lincoln bedroom of the White House.